What does it mean for hundreds of thousands of prisoners in the United States when the world's most famous prisoner faces possible death from medical neglect in a Pennsylvania prison? Often called the "Voice of the Voiceless" for his countless publications and broadcasts revealing the injustices of the criminal justice system, Mumia Abu-Jamal has seen his health slip away in a matter of months. Thousands of supporters worldwide and frequent visitors could not stop the burning black lesions that covered his entire body or the profound fatigue that, since February has sucked him into trance-like sleeps, or guards who punished him with denial of calls, visitors and yard for sleeping through morning alarms and the morning count. 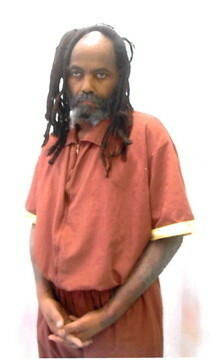 What does it say that on March 30, Mumia Abu-Jamal fell unconscious with uncontrolled -- and undiagnosed -- diabetes? Mumia's condition highlights the systemic neglect and abuse of prisoners in our nation's vast and ever growing system of mass incarceration. A daily diet high in carbohydrates, salt and sugar has left an estimated 80 thousand suffering from diabetes. Compounding the inadequate nutrition is the sub-par medical care provided by a vast for-profit provider that reaps some $1.5 billion a year in profits from prison healthcare contracts. Using an HMO model that puts cost-cutting above all, Corizon Correctional Healthcare has paid millions in legal settlements over inadequate or bungled treatment. Not surprisingly, the Bureau of Justice reported some 40 percent of prisoners and jail inmates in 2011-2012 reporting chronic medical condition such as asthma, cancer, heart disease, high blood pressure -- and diabetes. 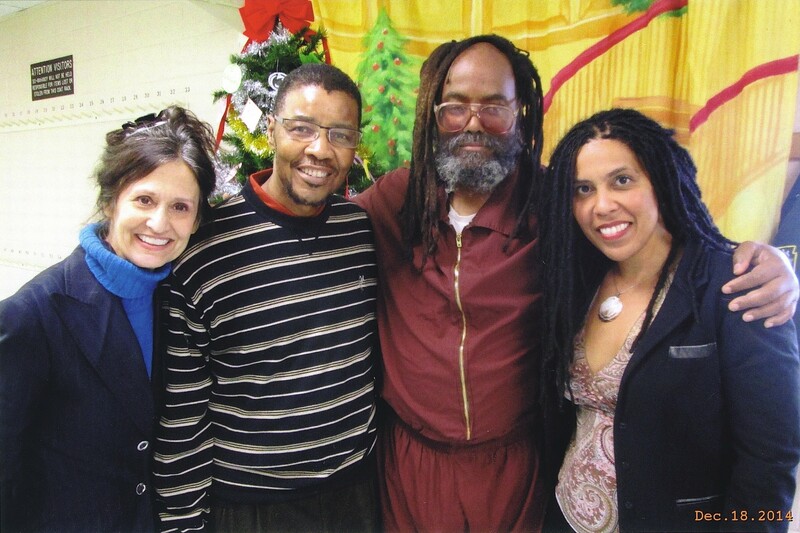 Mumia on December 18, 2014 with (from left) Heidi Boghosian, Keith Cook and Johanna Fernandez. For three days, Mumia received treatment at the ICU of a nearby medical clinic. His blood sugar and sodium level counts were catastrophically high at 779 and 168, respectively. The last time Mumia was hospitalized was on December 9, 1981, the night of the killing of Officer Daniel Faulkner, for which Mumia was convicted in a trial fraught with constitutional violations. That same night Mumia was shot and beaten up within an inch of his life by police. When he was finally taken to the hospital in a police wagon, he was thrown by police onto the floor of the emergency room entrance. After surgery, he woke to a police officer stomping on his urine bag. Mumia now languishes in the prison infirmary facing new assaults -- the cut-rate, sub-par care and inadequate nutrition that contributed to his earlier health decline and crisis. With a still abnormally high glucose level, hard crusted skin covering his body and a dramatic weight lost of over 80 pounds, he is in dire need of the attention of specialists in both endocrinology and dermatology, and healthful food. Mumia, 50 pounds thinner, got up from his wheelchair for this photo on April 6, 2015. As Mumia's health deteriorates, he would want us to draw attention not only to his plight but the plight of all this nation's prisoners who receive a malnourishing diet and sub-standard health care at the hands of rapacious private contractors. The race and class dimensions of this crisis disprove the notion that race doesn't matter in the age of a black president. The majority of U.S. prisoners are African American and Latino males in their childbearing years, imprisoned in a system that regularly violates their fundamental human rights and ravages their health. Mumia would want us to use his suffering to demonstrate that those relegated to the lowest strata of our society -- imprisoned black, brown and poor -- suffer not only their sentences but illness and death by neglect.